This easy jerk marinade is ready in minutes - just blitz everything together. 1. Put the chillies, salad onions, garlic, ginger, sugar, vinegar, spices and herbs in a blender or the small bowl of a food processor and blitz. Season well, then, with the motor running, pour in the oil until you have a thick paste, adding a little water to loosen if necessary. 2. Put the chicken drumsticks into a roasting tray and rub them all over with the paste. Leave to marinate in the fridge for 30 minutes (or overnight if you have time). 3. Preheat the oven to 200°C, gas mark 6. Roast the chicken for 30-35 minutes until cooked through, with no signs of pink and juices that run clear. 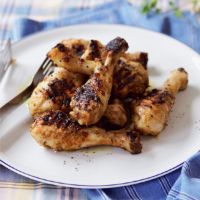 Remove from the oven and place directly on a hot barbecue or, alternatively, under a hot grill. Cook for 2-3 minutes on each side until well charred. Serve immediately. Mix 2 crushed garlic cloves, 1 tbsp chopped oregano, the zest and juice of 1 lemon, ¼ tsp paprika and 2 tbsp olive oil for a Greekstyle marinade. Try a sweet and sticky Japanese marinade using 4 tbsp soy sauce, 2 tbsp lime juice, 2 tsp grated fresh root ginger and 3 tbsp soft light brown sugar.